Pore-deep skin cleansing with an anti-pimple effect and intensive care effect with a pH value of 5.5 Combats pimples, blackheads and skin impurities Product features: Witch hazel soothes irritated skin and has an astringent effect to contract the pores Removes excessive oil, sebum and dirt particles from the skin and disinfects it with alcohol Cucumber extract and hydrolyzed silk provide moisture to protect the skin against dehydration Panthenol supports the healing of acne lesions Allantoin smoothes the skin and makes it supple Tones and refreshes the skin pH value of 5.5 stabilizes the acid mantle. Indication: Pore-deep skin cleansing with an anti-pimple effect and intensive care effect with a pH value of 5.5 Especially recommended for oily and combination skin to remove excessive oil after cleansing the skin Best suited for the use on the problematic T-zone Dermatologically tested - See more at. 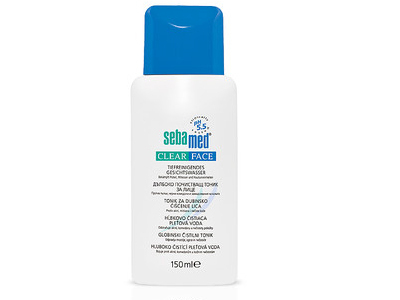 Ingredients: Pore-deep skin cleansing with an anti-pimple effect and intensive care effect with a pH value of 5.5 Aqua, Alcohol, Panthenol, Polysorbate 20, Glycerin, Propylene Glycol, Sodium Lactate, Allantoin, Hamamelis virginiana bark / leaf / twig extract, Hydrolyzed Silk, Cucumis sativus fruit extract, Hydroxypropyl Oxidized Starch PG-Trimonium Chloride, Urea, Caramel, Parfum, Sodium Benzoate, Potassium Sorbate, Levulinic Acid, p-Anisic Acid, CI 42090.